It’s extremely unlikely that scientists will ever be able to create an actual Jurassic Park with living dinosaurs, which is probably a good thing, considering how the creatures often run rampant and eat the guests in the movies. So what’s the next best option? How about a park full of Westworld-style robot dinos. That’s the dream of Kazuya Kenemaru, the CEO of Japanese company On-Art Corp., which unveiled the world’s biggest walking and moving dinosaur robots yesterday. Unlike the synthetic androids from HBO's Westworld, the machines here are controlled by humans inside the suits. And while similar models have been around for a while, these dinosaurs are about 30 pounds lighter and measure up to 26 feet in height. During the performance at a downtown Tokyo hotel, a robotic Tyrannosaurus Rex was the first to enter the hall, roaring toward the crowd before biting the head of a caretaker and swinging him around. The T-Rex was then joined by other dinos, including Allosaurus and Raptors. The creatures appear more realistic than those that had come before, thanks to the use of carbon fiber materials and the way they've been modeled from fossilized skeletons, according to the company. "The fact that we have been creating living things, the desire we have had to want to truly experience dinosaurs, and living things, to draw that out, these are things that spurred us on,” said Kenemaru. "We are striving to create dinosaurs that make people feel as though they are invisible, through how real the dinosaur's breathing and movements are." 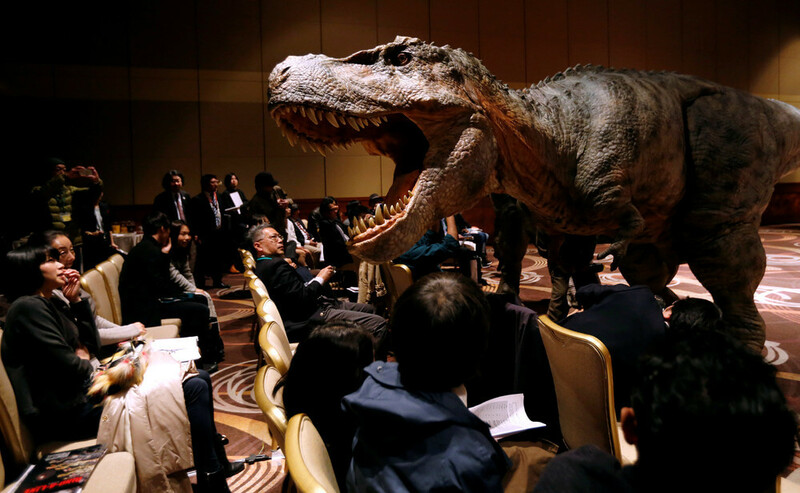 There are 12 of the new dinosaurs being used for various events across Japan. The CEO said his ultimate ambition is to create a “Dino-A-Park” like the one seen in the Steven Spielberg movie, where visitors can walk among the mechanical beasts without fear of being eaten.